Last week I happened to do an antenatal scan for a 25 year old lady. She had undergone surgery – total thyroidectomy – for papillary carcinoma of the thyroid when she was 18 years of age. Post operatively , her investigations revealed no metastasis and she was not offered chemo or radio therapy. Subsequently she completed her studies and is a nursing staff in a hospital . She is on tab levo thyroxine . She is a primi gravida and her antenatal scan was essentially normal. Seeing this lady gave me a happy satisfaction about my profession. I am mentioning this here , as such anecdotes could be big morale boosters for some other patients. The following case is of a different patient ,of a different age group, with the same diagnosis . This was a 50 year old lady who was evaluated for thyromegaly. 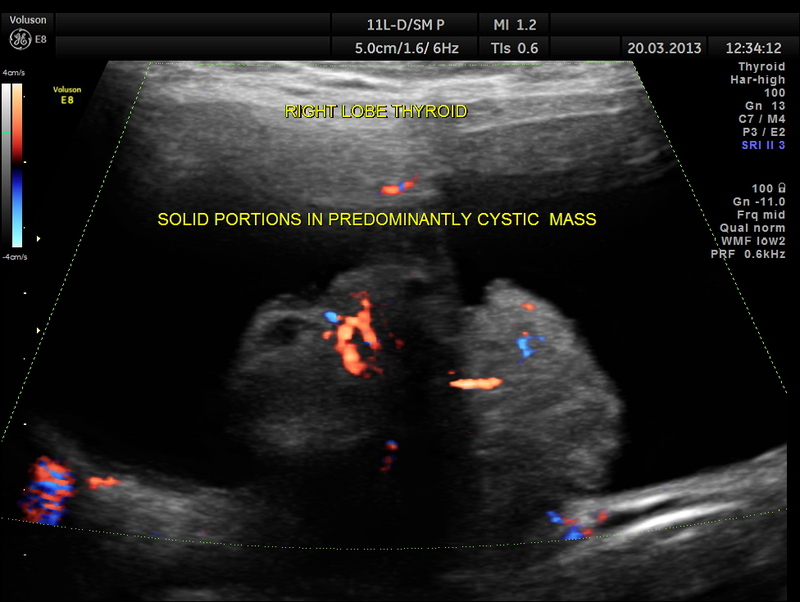 The left lobe of the thyroid was essentially normal ; showed two small cystic lesions. 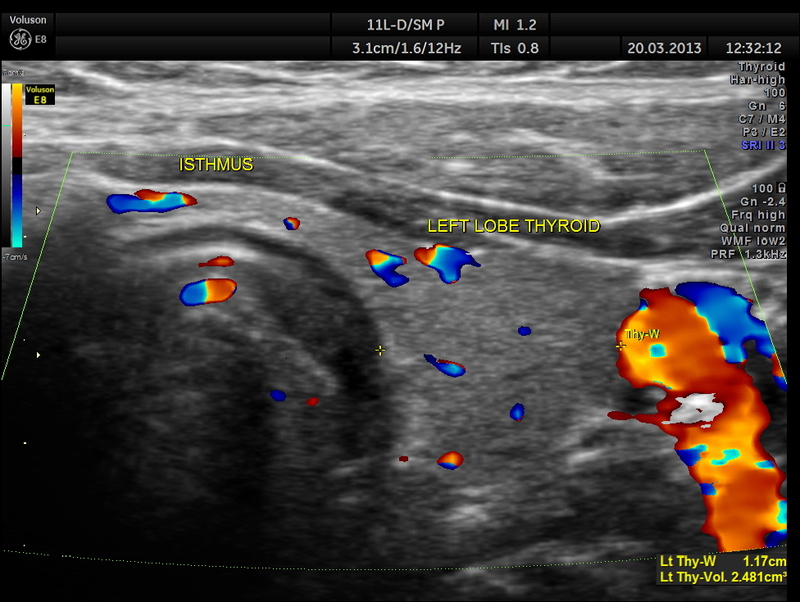 The right lobe of the thyroid was grossly enlarged , with predominantly cystic appearance , with eccentric solid tissue, with prominently increased vascularity in the solid portion. 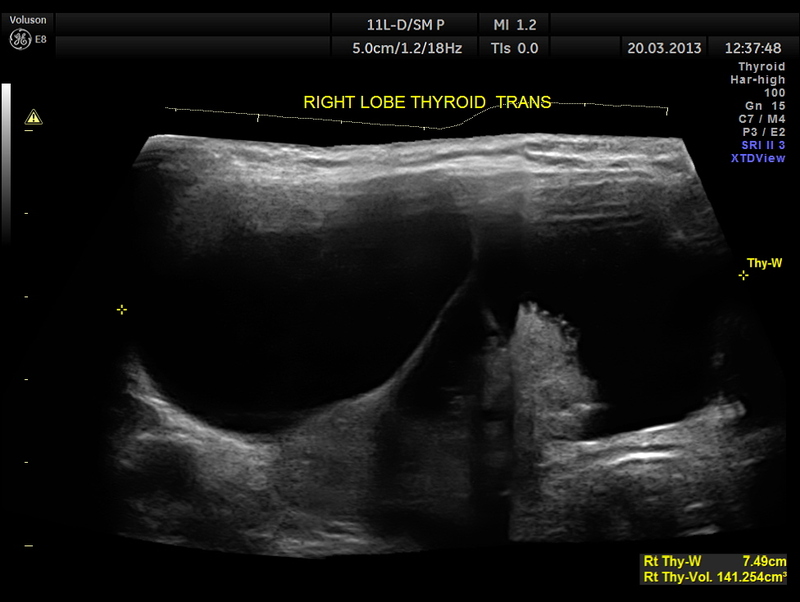 She underwent total thyroidectomy and post operative biopsy was reported as papillary carcinoma with nodal metastasis and muscle deposit. She was also given radiotherapy and also radioiodine . Subsequent annual radionuclide scans have been normal. She would have completed 2 years ,post surgery in April 2015. These two cases , in different ways , tell us that there is life after a diagnosis of cancer. Of the many articles one could find on the net , the following website is comprehensive , from the view point of the ultrasound practitioners. Papillary cancer is the most common thyroid malignancy, accounting for 75% to 80% of thyroid cancers, with excellent prognosis. 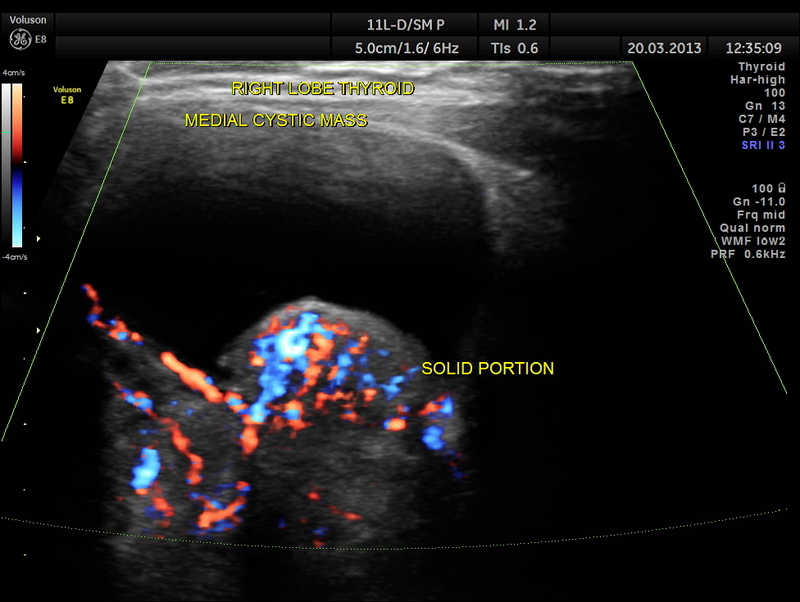 The most specific sonographic finding of papillary cancer is the presence of punctuate, non-shadowing echogenic foci termed microcalcifications. Some evidence of intrinsic vascularity is generally seen, though the distribution of vascularity has not been found to be a reliable finding. Papillary thyroid cancer metastasizes by way of lymphatics to cervical lymph nodes, which may contain microcalcifications, internal vascularity, and cystic change because of extensive degeneration. Follicular adenomas are encapsulated true neoplasms of the thyroid gland and represent about 5% to 10% of all thyroid nodules. Differentiation of follicular adenoma from a follicular carcinoma is based on the presence of capsular or vascular invasion on histologic examination and thus cannot be made by sonography or by FNA cytology. On sonography, follicular adenomas and follicular carcinomas are usually solitary encapsulated tumors, often with a well-defined peripheral hypoechoic halo representing the fibrous capsule. In contrast to papillary carcinomas, follicular carcinomas metastasize hematogenously to bone, lung, brain, and liver rather than by way of lymphatics. 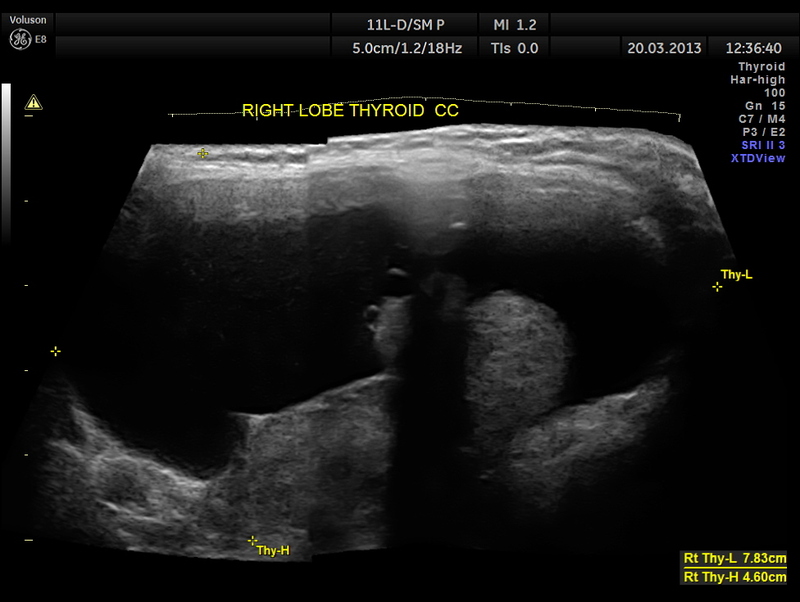 Medullary thyroid cancer is a neuroendocrine tumor arising from the parafollicular C cells located in the upper two thirds of the thyroid gland. On sonography, medullary carcinomas are typically solid, hypoechoic, and often have coarse central calcifications. Patients who have sporadic medullary carcinoma typically present with a painless palpable nodule in the fifth or sixth decade of life, but the disease is often metastatic to cervical lymph nodes at presentation. There is a slight female preponderance (1.5:1). Anaplastic carcinoma is rare (<1% of all thyroid masses) but extremely aggressive. Patients are usually elderly with a history of goiter and present with a rapidly growing neck mass. The tumor invades locally and distant metastases most commonly involve the lungs, bones, brain, and liver. Mean survival is 6 months, with 5-year survival rate of 7%. 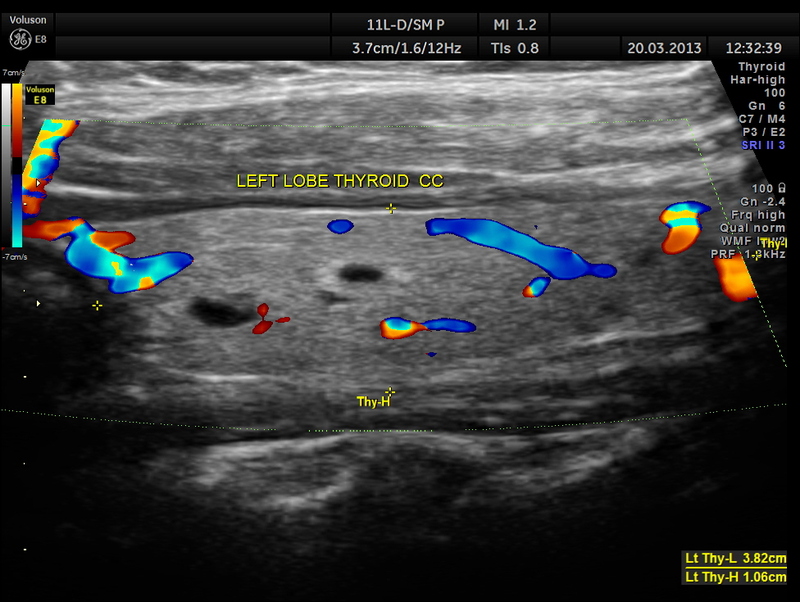 Radioiodine therapy is useful in well-differentiated thyroid cancer after thyroidectomy. We published a series of radioiodine therapy in childhood thyroid cancer in WJNM 2009 from CNMU Rangpur,Bangladesh.